"The lights went out, the heat was unbearable, and we couldn't breathe." Finola McDevitt and Yvonne Graham, friends from the Shantallow area of Londonderry, have spoken for the first time about the Stardust nightclub disaster. Forty-eight people died in the fire in Dublin on St Valentine's Day in 1981. There have been calls for a fresh inquest for years. Gardai sent a new file to the DPP in connection with the disaster in 2016. It followed a complaint made by a researcher concerning evidence that five of the victims were already dead before the alarm was raised. Three of the dead were from Northern Ireland. Yvonne and Finola lost their friend Susie Morgan. Both women spoke to BBC Radio Foyle at an event on Tuesday where some of the Stardust families met people affected by Bloody Sunday. Yvonne Graham said: "Five of us went to Dublin. 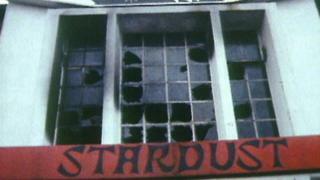 We were working in the Nazareth House and we all went out for the night to the Stardust nightclub. "Only four of us came back. My room mate Susie Morgan was killed in the fire. She was a friend to all of us. "It was a nightmare. Everyone was like wild animals trying to get out. We were running looking for each other but most of us ended up in hospital. We went to all of the hospitals to find Susie but ended up in the morgue." Yvonne said losing Susie has affected her over the years and she called for a fresh inquest. "Losing our friend has been so emotional for us over the years. We couldn't talk about it. We would love to see a new inquest. "It's terrible that these people haven't got justice 37 years on." Finola McDevitt remembers seeing a "ball of fire" coming towards them on the night. "It was horrific," she added. "The lights went out, the heat was unbearable and we couldn't breathe. We were tripping over everyone to try and get out. Everything happened so quickly. "We still look for exit doors when we go into a building." A tribunal held in the year following the fire, chaired by Justice Ronan Keane, was labelled flawed and the conclusion was contested by the victims' families. He concluded the cause of the fire was "probably arson". In 2009, an independent examination into the tribunal reported there was no evidence to support Justice Keane's finding that the fire was started deliberately near the ballroom of the nightclub. In 2017, the families of the victims rejected the report of retired Judge Pat McCartan which found no new inquiry into the deadly fire was warranted.